It's all in the question really. I am working on a proof in Fitch for a class, but I am very much stuck. I am proving the tautology that "(P → Q) ↔ (¬P ∨ Q)", and I have already finished half of it, but now I must prove that "(¬P ∨ Q)" implies "(P → Q)". I can't seem to get anywhere. I try to set up a proof by cases where I assume in different subproofs "¬P" and (in the other) "Q", but then I must prove "P → Q" from those. It seems even more difficult. Any help would be appreciated. Line 1 contains the premise. Since we ultimately want upon assuming "P" to get "Q", I assume "P" on line 2 by starting a subproof which according to the Fitch notation is indented. In order to get a contradiction I start another subproof and assume "¬Q" in line 3. In line 4, I use the disjunctive syllogism (DS) rule. I have a disjunction, "¬P ∨ Q", and "¬Q". I can conclude by disjunctive syllogism "¬P". See forall x: Calgary Remix, pages 124-5, for a description of this rule. In line 5, I introduce a contradiction (⊥) due to lines 2 and 4. 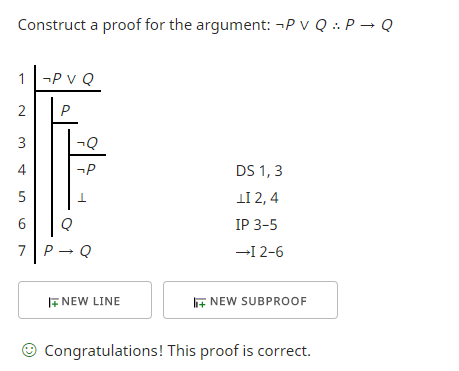 The contradiction completes an indirect proof (IP) which allows me to close the subproof discharging the assumption, "¬Q", on line 6. In line 7, I introduce a conditional from lines 2 through 6 which completes the proof. Since you seek to prove that a disjunction entails a conditional, therefore your strategy ought be to: use disjunction elimination and, in each case, conditional introduction, if you can. Then it is just a matter of deciding whether p would imply q under each from the two cases, and how if so.